I’m always looking for better ways to quilt, and recently I learned several things online that I think you may like, too. First, I just finished an art quilt that I wanted to face rather than bind. I’ve faced quilts before with variable success, but I wanted a refresher on just how to do it, so of course I did an internet search. I found this great tutorial by Terry Aske and followed it. The quilt came out MUCH better than my previous attempts! The secret is in NOT sewing around the corner and then trying to turn it. Here’s one of my corners. Look at that nice, sharp corner! 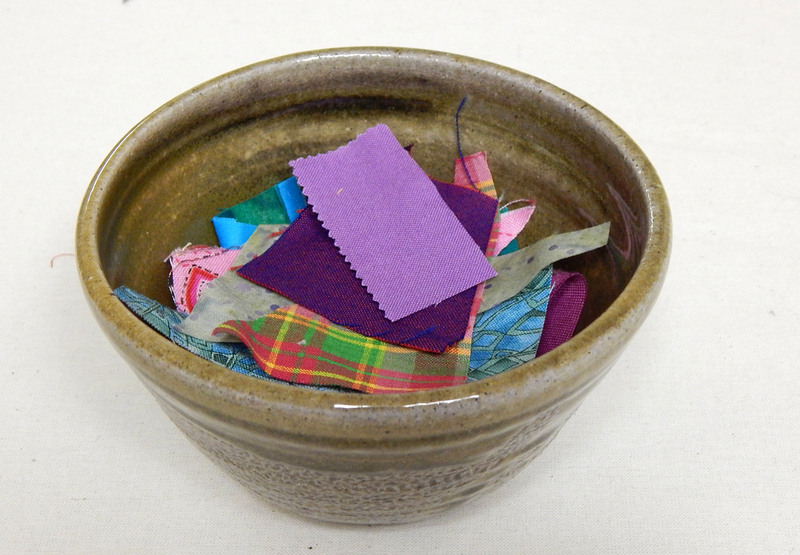 Sandy and Cindy at Gray Barn Designs mentioned putting scraps in a “starters and enders bowl”. I call those little scraps “bridges”, but the idea is the same: we need scraps to sew onto and off of when we chain piece in order to save time and avoid having the machine “eat” the thread when starting a new seam at an edge. I thought it was a great idea and I’m putting a bowl for such scraps in my studio right now! No more digging through the trash when I need a scrap to start or end a seam (yes, I know why they call bridges “starters and enders”). Finally, I ran across this article, by a quilter in Romania, suggesting that quilts be washed and blocked BEFORE they are bound! I had never heard of this idea, but in a lot of ways it makes sense. I have not tried this, but if I ever decide to make a show quilt that needs to hang smoothly, I probably will do so. The only thing I can’t figure out is how/where I would lay it out to block it. Somebody must have more open floor space than I do, or make smaller quilts! 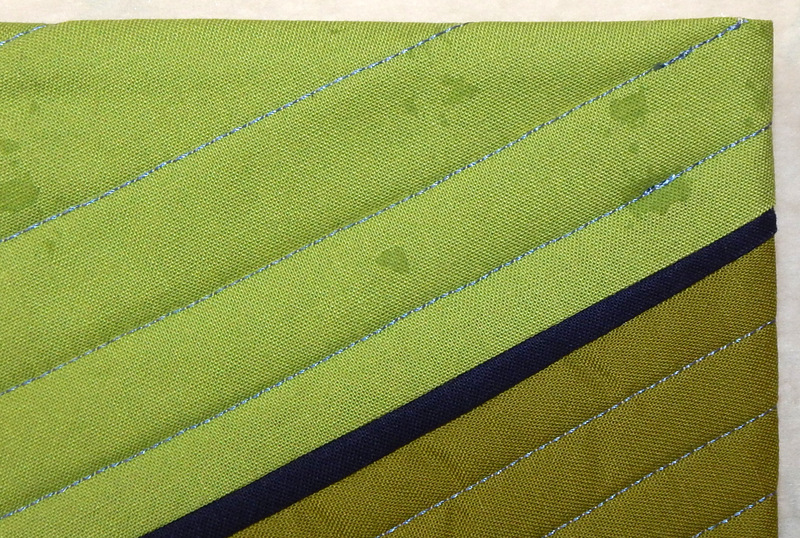 So I simply must know: Has anyone reading this tried washing and blocking a quilt before binding? I can see how it might make sense, but eeeek! The extra work! This entry was posted in Art Quilt, Quilting, Tutorial and tagged quilting hacks by zippyquilts. Bookmark the permalink. Interesting article on washing and blocking. I don’t generally wash my quilts when finished with them. Since I prewash fabrics, and I don’t have pets or smoke, and they don’t get dragged around dirty floors, I believe they are clean enough for any purpose I have. I’ve only blocked a couple of quilts, though more have warranted it. I did one early this year by laying it flat on freshly-vacuumed carpet, using a spray bottle to dampen the bubbly areas, and pressing them down flat with my hands. I ran a couple of small fans in the area to speed the drying. I resprayed the quilt a couple of times to continue moving it toward flat. When it was done I was very happy with it — square and flat and not distorted. Good to know. I have been hesitant to put a wet quilt on carpet, but just spraying it sounds less scary. Thanks for linking to my facing tutorial. I’m glad you found it helpful to achieve square corners. Good luck with getting the spots out of your quilt. Thanks. I took the quilt to the dry cleaner and will post when I get it back. Heck, I don’t even hand wash and hand block certain garments that call for it! I’m just careful with the washing/drying process. As for quilts, I tend towards pre-washing, drying and ironing fabrics before cutting and sewing. I always thought that would take care of most problems. Of course nothing can ‘fix’ something cut wonky related to the grain of the material. I usually prewash, too. I can’t see much point in blocking a bed quilt, but maybe a show quilt. Washed and blocked before bound? Wow that is quite the tip and I not sure if I would try that one – it seems sort of scary! But I use the others – I face most of my art quilts (using the technique in Jean Wells’ book Intuitive Color and Design; and I also learned that leader and enders (she calls them bunny tails) trick from her and this method is great when you are piecing small pieces.